Well where did it all start? The Dutch arrived in Cape Town in 1652 and built the Castle of the Cape of Good Hope on the shores of Table Bay. The Castle is a building in the shape of a star with 5 bastions which are named Buren, Nassau, Catzenellenbogen, Oranje and Leerdam. The construction of the castle began on the 2nd of January 1666 under the watchful eye of Commander Zacharias Wagenaar, the successor to Jan van Riebeeck. (I wonder if they got any work done on that day as it is a traditional holiday here in Cape Town) The Cape Town Castle was finally completed in April 1679 and still stands today. An elaborate gateway was built at the entrance and included the Coats of Arms of six important towns in the Netherlands. They can still be seen today. There is also a large brass bell hanging high over the entrance which in days gone by could be heard all over Cape Town. When the Castle was built it had a moat around it which was later filled with soil. It has recently been cleaned out and filled with water. The moat is once again an integral part of the castle. Outside the Castle's main entrance is the Grand Parade. It was built in the times of Van Riebeeck and is still there today. It is much smaller than it used to be. It once covered the area between the Castle and Adderley Street and then up Adderley Street as far as the Company Gardens. It is still a large open piece of ground with Darling Street on the mountain side and Strand street on the seaside of it. The Grand Parade has been used for public gatherings over the years. The celebration in 1863 of Prince Albert's wedding and the two jubilees of Queen Victoria were also celebrated here. The latest event to be celebrated here was the release of Nelson Mandela in 1990 when he addressed the crowds from the balcony of the City Hall. Across the road from the Parade is the City Hall. It is the last Victorian structure to be built in Cape Town. Inside it has large stairways and columns which are very interesting. City Hall taken from the Parade. City Hall has recently had a face lift with all its outside walls being cleaned. It is a lovely old building which is today used mainly for symphony concerts and gatherings. One should take a walk around the building to examine all the facades. Next to it is the old Drill Hall which is a long building that was especially built for volunteer soldiers to drill in when the weather was bad. The street between the Grand Parade and the City Hall used to be called Keizersgracht but its name was changed to Darling street in honour of the Governor Sir Charles Darling. 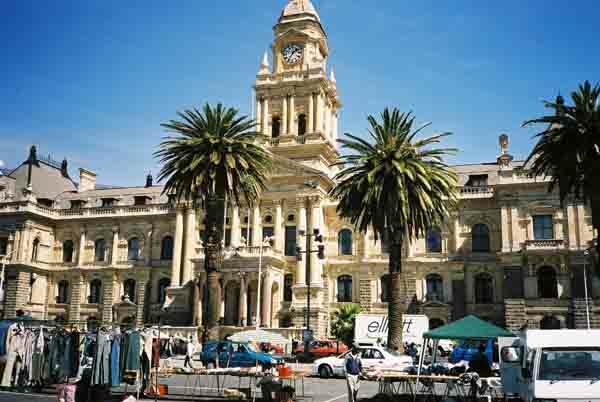 On the Adderley Street side of the Parade you will find the old Post Office building with its lovely columns and polished granite exterior. The building is no longer used as a post office and has shops and offices in it. On the edge of the parade near the post office is where the vegetable stalls of old were situated. Today a series of small shops have been erected where vendors sell their wares. On Wednesdays the Parade has an open market, where stall holders set up tables and sell anything from carpets to clothes. Its a good place to look for that old door hinge or cushion that you need to complete a set you have at home. The main use of the parade these days is that of a parking area. On the seaside of the parade is Strand Street and across the road is the new Cape Town Station. It is not so new anymore but it is known as the new station. When the new station was built it had two terminal buildings, one at each end of the building with the platforms in between. The entrance to the white side of the station is in Adderley Street whereas the entrance for non whites was into Victoria Road. This meant that the coloured folk had a very long walk into town if they worked in Adderley Street or beyond. Of course that has all changed now and everybody now uses the white terminal if they want to go to that side of town. In times gone by the Station mall was very staid with just the ticket offices and the odd restaurant catering for travellers. Today it is a hive of activity with hundreds of informal traders using all the nooks and crannies available to sell their wares. On top of the building is a large parking area which doubles as a taxi terminal for the hundreds of mini bus taxis that drive Cape Town's streets. Many a taxi war has played out on the roof of the station and people have even been shot and killed there. Authorities have now taken control of the situation and most of the problems seem to be sorted out. Occasionally they still have flareups. On the Adderley Street side of the station building a garden with lovely green lawns have been laid out to beautify the area. On the Strand Street side of the station an enclosed commuter bridge crosses from the station parking deck into the Golden Acre building. Its a tall glass building with offices in the tower block. It has three levels of shopping malls at its base and you will also see part of an old canal dating back to the 1600's which was discovered when they were excavating to build the building. All the underground shopping malls can be entered either from the station or the Golden Acre. Once you get underground, it is quite easy to lose your direction. Its not serious though, use the first exit you can find, look for Table Mountain and you are no longer lost. Why not visit Cape Town and come and see for yourself.